Every artisan, woodworker, craftsman, or DIY hobbyist need a portable workbench. But what really, is it? And why should you own one? This device is designed to collapse flat such that it can be carried or stored compactly. It seems easy, right? But choosing one can be a frustrating experience. Not when we have countless models to compare and test to see if they work correctly. We have found that workbenches are not built to the same standards. This means that you may get a model that looks okay, only to disappoint you in the end. That’s why it’s even more critical as these are not subtle investments. What is the Best Portable Workbench in April, 2019? Do you want to bring your workbench wherever it’s needed? 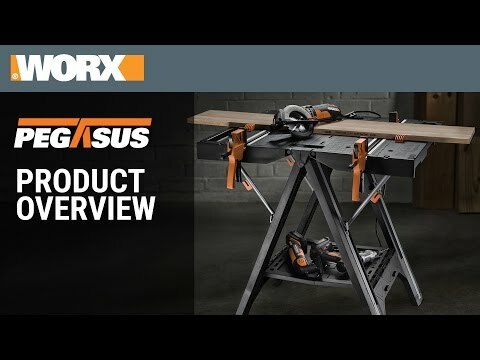 Well, the Worx Pegasus WX051 promises to deliver on that aspect and so much more. This item arrives folded in a Worx Pegasus box. You’ll not need to install anything. Just unfold it and settle it down to start working on your projects. It is versatile, flexible, and easy to load. The Worx Pegasus comes with four clamp dogs and two clamps. The clamps are easy to use and adjust when utilizing this workbench. The clamp dogs open up possibilities for working with different shapes of material. You can rearrange them on the bench when you need to hold strangely shaped objects. It also comes with links which are intended for use with other Pegasus work tables. It allows for accommodating oversized materials. You’ll like the clamping speed on the Pegasus since it does not need getting used to. The Pegasus folds down to only 5-inches depth for easy carriage. It achieves a small print which makes it easy to store in small spaces. It can go back to the packaging box when you need to put in the back seat of your car during transport. You don’t have to spin the handles when collapsing the unit. It slides into place without hassle. One of the most interesting aspects of the Pegasus is the versatility. You have a large working surface when it’s regularly used as a workbench. In the work table mode, it has a capacity of 300 lbs. But when you fold it down you get a heavy-duty sawhorse that can hold objects as heavy as 1000 pounds. Many of this items only offer the top working surface. But the Pegasus ensures that you have a place for your tools. The bottom surface is robust enough to hold heavy tools when working. The leg system locks into place to prevent its collapse in the middle of usage. It’s just what many people can anticipate when working with the Worx model. Whether you want to sand two-by-fours or you want to get handy on the go, the Keter Folding Compact 197283 is a great pick. It provides a sturdy worktop to help you work with heavy materials without worrying the surface will give in the middle of a job. Apart from the positive first impressions, you’ll notice that this procut is elegant and it stands out in any workshop. The Keter workbench has a capacity of 1000 pounds. It uses robust steel wheels that stabilize any load you want on the worktop. It provides reliable work support since steel is virtually unbreakable. As such you can count on it for complicated tasks. You’ll like that it comes with a pair of handheld clamps that secure the material in place. These clamps are adjustable meaning you can deal with different shapes of materials. They can also be installed in horizontally or vertically. Better still, the worktop provides a wide area where you can place oversized materials. You can feel that the surface is also textured to ensure that soft materials do not slide off the top. This is a compact workbench, and it has a fast opening and closing mechanism. It can take less than a minute to open it, and another 30 seconds to collapse it to a flat bench. The center support system folds first, to allow the legs to fold, after which the unit becomes flat on both sides, and you can carry it using the convenient carry handle. This workbench uses weather-resistant materials for its construction. This allows it to adapt to any working environment. It is built to resist corrosion, rust, and abrasion thanks to the polypropylene resin that makes every inch of the worktop. Keter also indicates that these materials are recyclable hence it is one of the environment-friendly workbenches you can find on the market. The first thing about the character is you can take it anywhere. It easy folds up and small as you could put it in your car. Also if you work in a small space it folds up out there. It has space underneath. And you can put your tools down there and organize these. With this workbench you get versatility. You can use it for a miter sailboat or a router table, a painting table, soldering table, a workbench for woodworking, or the outdoor your cooking. If you have a garden, you can use it for potting table too. This table comes fully assembled. You don`t have to mess around with stuff. You take it on the box and you`re already to go. Also, this workbench has two-year warranty. There are some things you need to know. The legs. If you yank it, you can really mess with the table legs. Also you will have this trouble if you release the clamps and push it down with your weight. It is enough to though the legs pop open and then you just push the tab into lock it and you`re done. You need to be gentle with the legs and pull on and react on them. Just let though gravity make the legs fold down and then lock the tabs in place. It holds 700 to 1000 pounds. But until you don`t lock this in place this is a weak spot. The next issue occurs when you fold the table legs. The legs do not completely go into the table body as they should. You need to additionally press them. If you carry them at a distance, they can go out on their own again. But you could get a bungee cord. And fix that really easy. This table doesn’t have any storage compartments. You have the clamps but when you`re done with them they`re easy to get lost. Also it has a lot of nooks and crannies on its plastic surface. Then, before each new task you need to rub the table well, otherwise your workpiece may get dirty. The table withstands a lot of weight and it’s true. But it is not intended to stand on it. This is especially true of the bottom shelf. If you use it as a tripping board, it will quickly break. It doesn`t have any way for add a c-clamp. Lot of people use a c-clamps because they`re inexpensive and work really good. But there`s hard to put them onto the table. The clamps work but they`re not heavy-duty. Although you can purchase separately those that are equal in value to the table. It all depends on your needs. The table lacks a grid of markup, which can often be found on other desktops. This adds more convenience to the workflow. BLACK & DECKER is a reputable company with workshop tools. The BLACK & DECKER WM125 is no exception as it exhibits some very reliable properties. Just like the other models, this workbench comes folded in a box. It does not also require any assembly. It looks brilliant on the outside with black legs and a wooden worktop. The frames on the Black & DECKER WM125 are built of steel. These legs are capable of holding as much as 350 pounds. It’s not the most heavy duty workbench for on the go projects, but you must agree its capacity can handle most projects in a woodwork shop. It retains its high-quality structure as it is resistant to scratches, peeling, corrosion, and rust. This indicates that it is a reliable product that you’ll get to use for a long time. This workbench exhibits its portability by folding to less than half its size. It collapses quickly to a subtle size that you can easily carry to different locations. The frame acquires a height of only 5 inches such that it’s going to be a breeze when storing it in a small space. Its portability also opens possibilities for moving it around your home when you want to perform repairs, or when you want to free up space in your workshop. If you’ve ever worked with a heavy material, sometimes it becomes hard to stabilize it. The WM125 comes with non-skid feet that prevent the workbench from sliding. You can use it on all kinds of floors from hard concrete, to soft wooden ones. It also preserves the floor by preventing any scratching when you drag the workbench to a different position in the workshop. The WM125 comes with adjustable swivel pegs. They allow for clamping of materials at odd angles. This should help you work on all piece shapes as well as complete projects in time. It helps to add to the accuracy of your work since you can put the pegs in the desired position. The jaws also resist warping when dealing with uniquely shaped materials. One of the convenient features is that you`ve got pre-drilled holes on the desktop. This comes with four little grommets which you can put in if you`re wanting to clamp a panel or shelf. If you`re dealing with big objects about big lumps of timber you can simply place it in the middle of the table. This need to fix the two jaws, which are on the side of the desktop. And it steady. You can work hands-free and be sure it not dangerous. When working with large objects, you can use the bottom frame and hold the table with your foot. The frame of the table is durable, so you shouldn’t worry that it will break. The Performance Tool W54025 has distinctly similar properties to that of the BLACK+ DECKER, but there’s a little twist to it. This workbench is more compact as it has a smaller print than any of the models on our list. It is in a bright yellow color that suits those that are keen on the sophistication of the exterior features. This tool is great for DIY enthusiasts. It carries a large working surface on the multipurpose platform. First, the tabletop has a grid, ruler, and protractor. It makes your work much easier by allowing the taking of measurements for the materials on the platform. It uses a one-handed clamp system to give the convenience of adjusting the jaws independently. The four bench dogs come in handy when holding oddly shaped materials. It preserves their surfaces by preventing any unwanted scratches. You can also make holes on workpieces without worrying the surface underneath is going to be damaged. The collapsible design of this tool makes it easy to transport and store. It does not take much space so whether you want it around the workshop or you have to stack it in an already full store, you can be sure no part is going to break in the process of storing this tool. You’ll also like that it has a storage rail that is essential in arranging your tools for work. The legs on the Performance Tool feature a steel construction. The yellow paint finish indicates it can last for long in the best condition. With the non-skid feet, you can sand with confidence knowing that it will not shift from a position. This model is a reliable, portable workbench and anyone can benefit from the features it showcases. If you are looking for a true workhorse, then you have it in the Kreg KWS1000 Mobile Project Center. This tool is one of many things including a workbench, assembly table, sawhorse, and a clamping station. It works great for professional and hobbyists projects as it provides great accuracy. It is a functional tool by itself, and it becomes even more useful when paired with other Kreg tools. This workbench explores an A-style steel frame. It is responsible for holding workpieces up to 350 pounds. The two tables have a construction from polypropylene resin. This makes it virtually indestructible from scratches, exposure to the sun and many other outdoor elements. Polypropylene is recyclable so you can count on this tool not to end up in a landfill. The Kreg Mobile Project Center has uses large top with dog holes and an integrated Kreg Clamp. It can accept lots of Kreg accessories so you are not limited to the kind of projects you can perform and complete with great accuracy. You can secure stock horizontally using the Automaxx bench clamp which slides into the center-mounted T-track. The Kreg screw containers allow for hooking notches on every dimension of the worktop. It is also expandable by pairing it with another Kreg workbench. This aspect should come in handy when you want to work on overly large pieces. It connects quickly using the convenient brackets which ensures that all the clamping features are still available after expanding the worktop. When you fold down it, this tool converts into a dependable sawhorse with a much more significant weight capacity. The Kreg KWS1000 has built-in trays to hold screws, and it also has holsters to store your drill. The lower shelf has a weight capacity of 25 pounds. You can store much larger tools when you want to access them quickly in the middle of a project. It helps to keep everything at hand’s length but still out of the way for a clean working surface. This table has a removable aluminum locking mechanism. All you need just put its screw into the groove and move it toward the material. You need to clamp it down to stability. When folded, this table does not look portable. Its weight is 45 pounds. When you pick up a box for the first time you will find that you made the wrong choice. In comparison, other workbenches weigh up to 25 pounds. But the weight tells us that the table consists of another material, which means it is stronger and more reliable. If weight matters to you, remember that this is a heavy workbench. But real serious pinching hazard along the hinge where the table actually opens up. You can pinch your fingers a few times before lifting it up. Since the table is heavy, for the first time it is better to learn how to unfold it with someone’s help. Before you embark on the search for the best mobile workbench, here a short guide to help you through the process. If you want to perform quick repairs around the home, a portable workbench is more convenient when accomplishing such tasks. It is not limited to the location meaning it can go anywhere the project takes you. What’s more, you can work in remote places around the workshop since most of them occupy a small space. Easy to assemble – most portable workstations require unfolding of the tool instead of putting together parts. It can open in as little as 30 seconds. Folds flat for storage and transport – these tabletops are relatively lightweight. They collapse to a subtle size making it easy to store in a small space. Some have carry handles to help with the transport. They don’t compromise on the features – Although portable; most workbenches have similar capabilities as that of stationary workbenches. This includes the working height, large work platform, and heavyweight capabilities. Heavy-duty Construction – these tools feature steel and aluminum frames with abrasion resistant properties. They are much like stationary workbenches with the convenience of portability. The legs lock such that they are sturdy enough to accommodate weights up to 1000 pounds. Versatility – portable workbenches can convert into sturdy sawhorses just by flipping the legs. They carry the risk of collapse – during applications of heavyweight materials, these workbenches need to be 100% secure otherwise the feet may collapse and cause serious injuries. They are not also safe when conducting dangerous tasks like sawing and drilling. The portable workbench don’t have a high load capacity when compared to permanent workbenches. Heavyweight construction. The weight of the workbench has its advantages and disadvantages. If the table is heavy, then its frame or all parts are metal. This gives the workbench stability. And your work will be easy. But at the same time, you get less portability and there is a chance of injury. Therefore, if weight matters to you, then pay attention to plastic models. Spare parts. Before buying a workplace, ask if there is an opportunity to buy spare parts for the workbench. These are bushings, grommets, clips, locking mechanisms and other. This is especially important if the auxiliary parts of the workbench do not have a separate storage place directly in it. Often, small parts are easily lost when working. If you use it from time to time, the possibility of loss increases. If you work continuously with workbench, then plastic auxiliary parts of the table may wear out. Therefore, you must be sure that you can buy the missing parts if you suddenly need it. Clamps – in any woodwork shop clamps are never enough. You should ensure that your workbench comes with several of these. Large benchtop with vise – the bench should be sturdy complete with holes to accommodate bench dogs. It should also have a vise at the end of the top to hold pieces together in place. 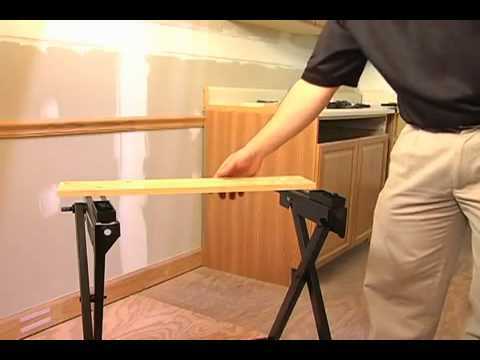 Sawhorse compatibility – you’ll need a sturdy work base which can hold over 500 pounds of load. An all-around workbench will convert into a sawhorse for heavy duty tasks like sawing. Tool storage – you’ll need a place to store hand and power tools. The workbench should have a lower shelf or a tools rail for that convenience. Wheels – Although they are not a must have, wheels provide the flexibility of using the workbench in different positions of the workshop without dragging it around. What is the Ideal Height for Your Portable Workbench? Every artisan has this question in mind especially if your back aches after working for long hours. Being able to adjust the height on the workbench is a big convenience. But if you can’t: just get the measurements of the distance from the floor to the inside crease of your wrist. This should provide the correct height that should not hurt your back. For industrial purposes, metallic frames are preferred on workbenches. They can accommodate materials weighing hundreds of pounds by resisting the pressure of the extra weight. Plastic, on the other hand, cannot withstand lots of weight. In fact, most of them fall apart in the first year. The only advantage with plastic legs is that they reduce the weight of the workbench making it easy to transport them. They provide flexible worktops – some projects are better-done standing while others are polished when seated. With adjustable legs, you can complete projects at a comfortable height. They require less floor space – you can adjust the legs so that the workbench occupies only the available floor space. They pose the risk of collapse – by adjusting the height it means you have to lock that position. If the height is not secured correctly, the workbench may collapse in the middle of an application. While there are lots of advantages of owning a portable workbench, picking one is not always an easy part. We’ve researched some of the best that stack up to the models on the market. These are the most lightweight, compact, and functional brands. They have heavy-duty designs and remain versatile for a wide variety of projects. you can not work with huge load on BLACK & DECKER WM125 Workmate 125 Portable Workbench. also it doesn’t work/support as Performance Tool W54025. Nice review. I’m wondering if I need to attach three workbenches in a L shape, how many connectors do I need? Thanks for the answer in advance. You need four of them in case you’d like to ‘connect’ 3 tables together. But keep in my mind that each table comes with 2 connectors, so as a result you’ll have 6 ones at your disposal. The best thing I like is that I easily can convert my workbench into a sawhorse! I just leave the saw clamped in the table and store them both like that. As a portable miter saw it works well, you just use including swivel grips pegs to clamp it. Good morning! The biggest advantage of this workbench is using the way you like and you choose, so as a saw table – it’s up to you! There are many-many variants on how you use it. Glad you like it. You know, I live in a small apartment and it is very maneuverable! I can pop this workbench open in my living room and do whatever I want, then fold it back up putting in the closet. What should I say? I love my Black & Decker Workbench! Thank you for your feedback! Because of the weight capacity it’s a very nice idea to use it not only in the workshop, but also in the place you live. If you are an amateur – that’s a high and professional mini workbench! I’d like to buy a portable, collapsible and inexpensive workbench to do minor DIY-things in the backyard and hide it when completed. What can you advise me? Hi! We’ve reviewed several models above, so it depends on your financial opportunities then. You may use the information from our article and choose the most suitable option for you. Ooops…I discovered that I cannot skew the boards. How can I do that? Thanks. Hi! It is possible to tight only 1 vise. You can also arrange 4 plastic supports in any 12 holes to secure even more irregular pieces. But, be careful: the rail of vise cannot be totally secured and this way the back of the board has approximately 25% of play. You can try to shake pull the rail outward and rotate the handle until the boards are touching. Don’t rotate the handles, try to push it inwards to create a small gap. Good luck! I’ve just bought Kreg workbench. The only thing that makes me confused is the handles. If they engineered them better, I would give 5 out of 5! I hope to get much use out of it as the price paid. The price is really reasonable, so you won’t be disappointed with that. The quality of the product is as described above, so if you relied on the information from our site, everything should be fine. Thanks for the comment. I need something to hold the shelves on order to plane the ends with an electric planer. Will it help me? Thnx in advance. Yes, in this case portable workbench is a good deal! That’s a small investment to hold the things as needed. It’s suitable for holding reasonable things to work on, fix or paint. Now I have Starrett Measure Stix SM44ME. Can I attach this to another side of the new workbench to have my job set up? Sure, if you work on small projects and you already have the stable surface to work on, that’s what you need. You can make one big surface from the two of them. Luck! You let me see that Keter Folding Compact is so much more to this table than I thought before. I just wanted to say great review. I guess it all comes down to what you are needing from a work table. I have rarely seen such tool. It has no faults. Really. I am always searching the least possible faults (no matter who the manufacturer is. Over the years I have found Keter. They are always willing to satisfy their customers. Greetings! We are so glad you like it! Personally, we think, we need more companies in the U.S. like this! Good afternoon! It really has a metal structured base. It will not rust until the painted covering is damaged. It would be better if you kept yours in a dry place. If you check whether the surface is not wet, we are sure you will not have any problems. Hi everyone! How high is the workbench Black Decker in inches? I am rather tall. Will it be suitable for me? Hello! Welcome here. The height of this workbench is 32 in. Anyway it depends on your height. Eve if you are over 6’6 that is not a problem. It can be too high for some projects but then you will not have to bend over it. You can see it is fine choice either. Here will be some piece of advice for you. Bamboo is the main material which the tabletop is made of. The rest of the working surface is a three layer crisscrossed wooden strips glued. They are pressed together so that it has a solid piece. We hope it will help you. Good luck! I read product description twice but I cannot find any words about pegs. Please advise if Black and Decker comes with Workmate swivel grip peg. As you may see in the picture it comes with 4 pegs. But you may use them in any other way with no trouble. To hold some work pieces for example. Thanks for sharing this good information and thorough review. I am writing about Kreg mobile project center. It is very nice piece of kit but there is no jaw plate for 90 degrees’ clamp. That’s a pity you don’t have it in your kit. You could make your own jaw plate for your Kreg 90-degree clamp and solder it on – as an idea! Like an alternative – hot glue can be cast into a shape which slides on. This way it can be removed when you like. As your article is so useful, I may conclude you may provide me with some information on how create a framework to allow me to rip sheet goods with a circular saw. Please. Thanks for your question. It is great that you found out another additional capability. To extend the table mode cut your sacrificial sawhorse 2*4’s to the full width and attach them to the tables. After that, insert the blue side brackets in the middle of the three slots and position your 8′ 2×4’s as before. Don’t forget to check your cut depth! 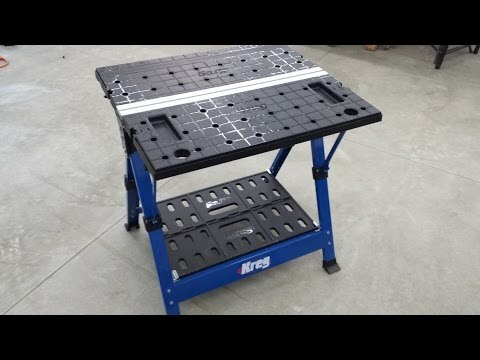 Kreg workbench that I am thinking of. Included bench dogs and clamp make the workbench special. But what about weight? Heavy or light? What about Worx? May be it is also good. Hello! If you work yourself, it is very important to have a convenient tool within your reach. The disadvantage of Kreg model is that it weighs just under 40 pounds. It’s heavy so that will be rather cumbersome when you move it. This is directly related to how well made it is. The manufacturer added strength at the expense of weight so it’s a clear case why it is so. If you’re looking for a great option, then this is one of the best folding workbenches on the market right now. Worx is a good choice if you are looking for the table that is similar to Kreg but is much lighter. So you will see a big difference while moving it around. It’s also very sturdy. Like the previous model, it can be used in multiple different configurations, as a regular table or as a sawhorse. Keter, Black and Decker that’s ok but I would like to buy Goplus workbench. Goplus Folding Workbench. I trust you and I am waiting for your reply. What is your opinion about that? Wow! That is a good point! There is another traditional-style portable workbench. It is not expensive, which is the best thing it has going for it, everybody can afford this. Besides it does have some unique features. It concludes a ruler down one side of the table. For the situations where you have no easy access to a tape measure – it also fits. It also comes with 24 different pre-drilled holes for placing them, which means it’s easy to hold a board down, even if it’s shaped in a strange way. You may use it for situations where a rough cut is ok. Additionally, there are 4 bench dogs. What about quality control problems…this model really suffers from them. The holes for the bench dogs aren’t always properly drilled, it means that they sometimes aren’t held tightly or don’t fit. This table is not the sturdiest. Even when you only use lighter tools and woods on top of it. Unstable workbenches are a problem to work with, you know. They make it easy to make small mistakes, so at the end the final pieces not fitting together properly. Looking at those two problems, this model is likely to be a frustrating one for most people. If you’re looking to have an experience with no worries, then you’re better off considering a different model.